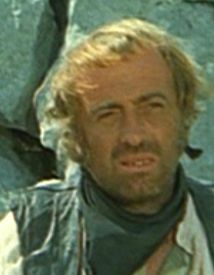 Enrico Chiappafreddo is another of the many unknown Italian actors who participated in over 40 films from 1961 to 1978. He was sometimes billed under the aliases of Bruno Chiappafreddo, Chiappafreddo Enrico and Henry Kalter. Most likely born in Italy in the 1930 he was a supportin actor in 17 Eurowesterns specializing in lying henchmen and saloon patrons and brawlers. Like so many of these supporting and character actors once his film career ended he evaporated from the public eye and where he is today or if he is still with us is unknown. CHIAPPAFREDDO, Enrico (aka Bruno Chiappafreddo, Chiappafreddo Enrico, Henry Kalter) [Italian] – film actor.